USAC issued Wave 27 on Friday, October 12th. Cumulative funding as of Wave 27 is $1.83 billion. The FY 2019 administrative window is open and will remain open until roughly January 7th at which point EPC entity profiles will be locked for the duration of the Form 471 application window (estimated to be January 10th – March 20th). The first sessions of USAC’s fall training for FY 2019 are being held in Washington DC this week. Copies of the presentation slides are posted under 2018 Applicant & Service Provider Trainings (scroll down to see individual topic slides). For many years, USAC has outsourced the majority of the staffing for PIA application review, post-commitment changes, and invoice processing and review to Solix, Inc., in New Jersey. The contract with Solix is nearing expiration. Last week a replacement contract was awarded to MAXIMUS Federal Services, Inc., of Reston, Virginia. We expect the transition from Solix to MAXIMUS to be challenging for both USAC and applicants. 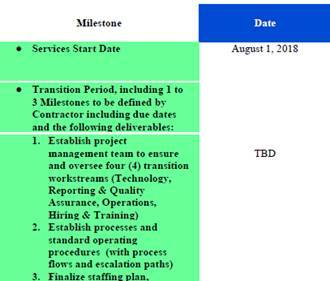 The transition plan, as set forth in the original RFP issued last March for “SL Business Process Outsourcing Services,” included the following milestone timetable. The anticipated contract award date under the RFP was subsequently revised to September, so the actual award is already at least a month behind schedule. What did occur in September was a contract award to Deloitte Consulting “to support the transition of a new Business Processing Outsource (BPO) contractor” through the “establishment of the SLD Project Management Office (PMO).” That transition support contract indicated that Deloitte’s support would require a staff of 5-7 people for a period of up to 18 months — suggesting, we hope, that the transition will involve a phase-in of MAXIMUS with a gradual, manageable phase-out of Solix. For applicants, the first indications of the transition may be expected during PIA review of FY 2019 applications. Stay tuned; this may be an interesting ride. Prospective Form 471 Changes for FY 2019: The Form 471 for FY 2019 will not be available in EPC until the application window opens (hopefully in the second week in January). Early indications are that the only EPC format change to the application process will be new screens to facilitate microwave or satellite options for broadband special construction. Previously the default assumption had been that such construction would involve fiber networks. To be technology neutral, wireless alternatives are supported, but had to be described separately in the Form 471’s narrative section. The new EPC version of the Form 471 will contain additional screens to support what is being called, at least initially, “wireless fiber FRNs” — an amusing oxymoron to brighten up the application process for technology outliers or those constructing hybrid fiber/wireless networks. After picking one or the other, applicants will get the following reminder to check “No” on a future Network Equipment question for special construction. This message is intended to serve as a reminder to file for recurring services such as maintenance and operating costs on a separate FRN and not to include it as part of the special construction FRN. A second Form 471 change expected for FY 2019 will be the availability of a PDF version of each applicant’s committed Form 471. Currently only the original version of an applicant’s Form 471 is available as a PDF download in EPC. The new post-commitment Form 471 PDF will reportedly become available after the application window closes and funding waves begin. October 25 USAC webinar providing an introduction to EPC for new applicants. The FCC issued three E-rate decisions last week, each interesting and unique in their own way. DA 18-1055 dismissed and denied a petition for reconsideration by the Detroit Public School District regarding previously denied applications for FY 2013-2015. USAC’s denial had been based on the district’s failure to consider the price of eligible services as the primary factor. Denied four appeals as being late. It rejected the company’s contention that the lateness was excusable to the extent that correspondence had been addressed to the debarred and ill owner. Rejected the company’s contentions on the other appeals that recovery is (a) required only for statutory violations; (b) barred under the owner’s pleas agreement with the Department of Justice; and/or (c), are de minimis amounts. DA 18-1060 granted two waivers of the operational deadline for the special construction of fiber networks. Under the 2014 E-Rate Modernization Orders, new fiber networks must be in full operation (i.e., with lit fibers) by June 30th of the funding year for which such networks were approved. Note that this service delivery deadline, unlike that for other non-recurring services, does not provide an extra three months to September 30th of the following year. The FCC rules, however, do grant USAC the authority to extend the fiber operation deadline for one year upon a showing of good cause — often including delayed approval of the fiber applications, a common occurrence. In last week’s decision, both applicants with delayed approvals of FY 2016 applications, had already received extensions to June 30, 2018, but still needed more time. Both waivers granted reflect the FCC’s understanding of construction issues associated with large fiber builds but illustrate the need for clearly documenting requests for additional extensions. The Jemez Pueblo Tribal Consortium’s network was 90% complete by last June but sought an additional two-month extension from USAC to finish. USAC punted the request to the FCC. The Consortium explained that the project was scheduled for completion by June but had been delayed by the State pending the completion of an archeological survey. The survey — and the network — were finished by the end of July. The FCC approved an extension to July 31, 2018, so that USAC can process the last invoices. The Grants/Cibola County School District’s request reflected extensive delays in USAC’s review process. Although the district’s initial FY 2016 was funded in January 2017, USAC asked additional questions in April 2017. Pending reaffirmation of funding, Grants/Cibola requested and received a one-year deadline extension to June 2018. USAC did not complete its post-approval review of the Grants/Cibola fiber funding until August 2018 — 16 months later! USAC, apparently unauthorized to further extend the deadline, denied the district’s request for a second extension. The FCC granted an extension through April 2020 giving the district a full 18 additional months to complete the project. USAC’s Schools and Libraries News Brief of October 19, 2018, indicated that this year’s round of Payment Quality Assurance (“PQA”) requests will begin in November. The PQA program is designed to statistically assess the proper payment of invoices. We expect that USAC will be conducting what we term “mini-audits” on FRNs associated with approximately 300 invoices paid during calendar 2018. Requests for information including bid evaluation documentation will be emailed to randomly selected applicants from the domain usac.i-sight.com. * Another point is that documentation is important, positively or negatively. In this case, an email indicating that bids need be evaluated “on factors that ‘over-ride’ the primary factor price to get a favorable outcome” did not help.